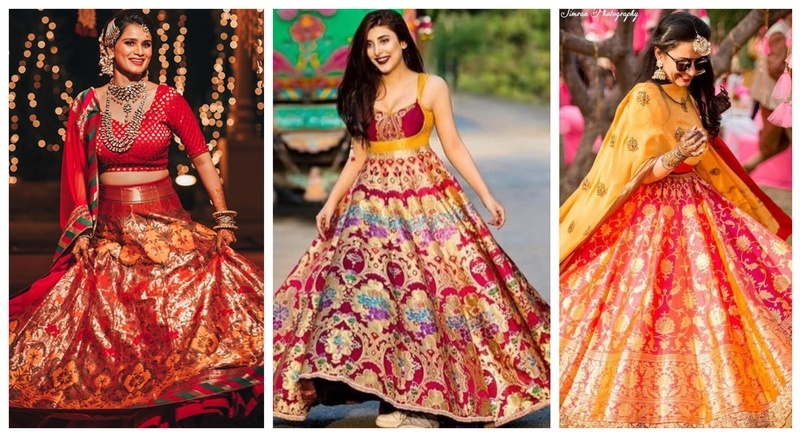 20 Banarasi Lehengas we have fallen in Love with! “Banarasi is a not only a fabric, it's a legacy”, don't you think? There’s something totally regal about a bride decked in a banarasi lehenga. We’ve been eyeing more and more brides opting for a banarasi lehenga off-late and they look breathtakingly ethereal. I understand the fascination too, as the lehengas are rich, classy, timeless and have an understated glamour of its own. Also, Banarasi silk is very light and flowy, which makes it suitable for all seasons. Unlike net, velvet and silks which can be irritating in hot climate, Banarasi silk is easy to wear and looks comfortable yet stylish. Before we start with Banarasi lehengas, let’s talk about Banarasi ‘gowns’ first! These sister-duo spotted these oh-so-stunning Banarasi gowns and we can’t get enough of these! The best part, they paired them with a pair of cool white sneakers and slayed the look like it’s nobody’s business! Perfect for a bride’s mehndi, and apt for all bridesmaids! Love how she has paired her all red banarasi lehenga with jewelry with green gemstones. Also, the way she has draped the dupatta across one shoulder is totally stunning and refreshing at the same time. What’s unique about this lehenga is the fabric from Ekaya, the blouse from Rohit Bal and the dupatta from Janavi all brought together to create that perfect look! This bride wore an ombre pink red banarasi lehenga for her pre-wedding ceremony. Yep, we totally approve! Love the vintage vibes in this one! Pink Banarasi lehenga with a dark sheer pink dupatta is a stunner. Although, the way this bride has styled it makes all the difference. The layered necklaces, the kamarbandh and the oversized nath. This one does not have that all - banarasi feel to it, given the golden work on the lehenga, but Sagarika Ghatge sure knew how to slay this Sabyasachi creation. This bride chose to wear a super pretty pink and purple lehenga for her wedding. Look at that radiant smile! We love how simple yet royal this bride looks! This bride chose to wear a red lehenga with a hint of green and yellow and looked ah-mazing. I love the perfect amalgamation of the colours! Love how this bride chose to keep it subtle with a hint of colours! This bride wore an indigo and golden coloured lehenga topped with an off shoulder, puff sleeved matching blouse for her mehendi. Alia Bhatt looked stunning in this parrot green Raw Mango Banarasi lehenga which she wore to Sonam Kapoor’s diwali bash! Can’t get my eyes off, how Karishma Kapoor styled her pop pink Banarasi lehenga with huge motifs on it paired with a simple dupatta. That off-shoulder blouse of Kiara Advani’s off-white and pink Banarasi lehenga which she wore to the #AntuMoh wedding, is a stunner. This Delhi bride got everything she wished for- her prince charming, the perfect Delhi weather and a pink banarasi lehenga for her wedding! Brownie points to Aditi Rao Hydari, for that dupatta drape! Love how Soha Ali Khan has added the pink-beaded necklace on the beige blouse to bring the pop of colour to it. This bride paired her teal banarasi lehenga with a fuschia pink banarasi dupatta. So eye catching! So with this, I’m hoping you would have decided on a Banarasi lehenga for one of your wedding functions as well!